Do Face Oils Make Spots Worse? The short response to this question is NO, no Face Oils do not (generally) make spots worse. In fact, when it comes to some types of spot-prone skin, facial oils can actually work wonders and since using facial oils on my dry, spot prone skin I have seen such an improvement in the number of blemishes and spots I get. Ever since my mid-teens I’ve been spot prone. Bad skincare routines, poor quality make up application and a rubbish diet have all contributed to my poor complexion over the years. In to my mid 20’s I convinced myself that there was no solution, that I was an person who was always going to be spot prone and I quickly self determined that I had ‘adult acne’. Adult Acne and the term ‘acne’ in general, seems to be thrown around so much, without people realising that actual acne is a little but more than just getting the odd spot and break out. I cannot tell you the exact differences, as I am not a dermatologist, however, I can tell you now – I definitely did not and do not have acne. What I had, and still do have, is a dry complexion which over compensates by producing more oils. These oils tend to block my pores and I end up getting spots. I went through years where every morning I would wake up and have at least 3 new spots a day. They’d always be on the surface of my skin and were never in one particular area. Since using oils, my skin is getting such a concentrated dose of hydration which doesn’t block my pores like a cream tends to. 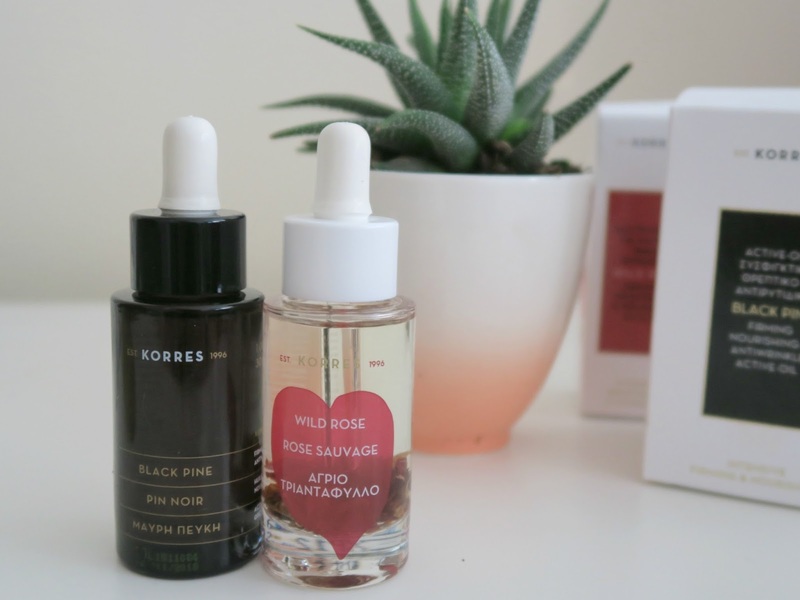 The KORRES Black Pine Oil is my daily go-to at the moment, as the blend of ingredients not only delivers a dose of hydration, but it also targets wrinkles and suppleness of my skin. I’ve used a range of oils over the years, from Rose Oils to Coconut Oils and I’ve yet to find any detrimental effects for my skin type. Not only do I find that face oils help to prevent my spots forming in the first place, but when I do get the occasional spot, the oils soothe them much more quickly and take the redness away. Any face oils which contain Jojoba Oil tend to have the best effects when I suffer from the spots, but I do find anything with Rose Oil is also great at clearing them up faster. Overall though, if I keep my skin hydrated and cleanse properly every day I’m keep spots more and more at bay. When using oils I do only use them at night before bed time, as I am still a little scared of my make up slipping during the day if I use them in the morning (although I haven’t ever even tried to use them in the morning to confirm this!). I have seen a lot of YouTubers blending their foundation by adding a few drops of oil directly to the sponge. If you’ve tried this please let me know if it works! I’ll try it myself soon though, as the result appears to be flawless. Even though I cannot speak from a technical, dermatological point of view, I can tell you from a personal one – Face oils did not make my skin or spots worse. They have been a skin-savior from the day I discovered them. If you have dry, spot prone skin I would highly recommend that you give facial oils a whirl!